Central Excise duty on diesel has increased by over 380% since the BJP government came to power in 2014. During this period, excise duty on petrol increased by over 120%. The revenue through central excise duty on petrol & diesel has more than tripled between 2013-14 and 2016-17. Retail selling price of Petrol has crossed Rs 70 in most states while the price of Diesel is close to Rs 60. Prices of Petrol & Diesel have always been an important part of the public discourse on price rise. Data shared by the government indicates that the excise duty on diesel increased by over 380% since the BJP came to power while it increased by over 120% in the case of petrol. Central government revenue through levy of excise duty on petrol/diesel has more than tripled in the three year period between 2013-14 and 2016-17 owing to this increase in tax rate. The excise duty on unbranded diesel was Rs 3.56 per litre on 1st April, 2014 just before the BJP came to power. The excise duty on unbranded petrol was Rs 9.48 per litre on the same date. Since then, it has been revised 11 times during the last 3 years. From Rs 3.56 per litre, the excise duty on diesel increased to Rs 17.33 per litre, an increase of over 380% in 3 years. 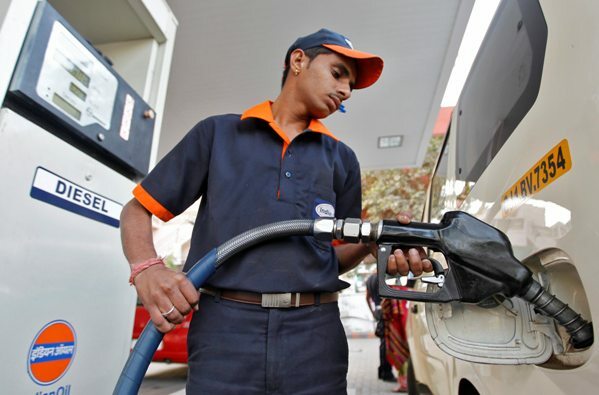 In the case of petrol, it increased from Rs 9.48 per litre to 21.48 per litre. On four different occasions, the excise duty on diesel was increased by Rs 2 or more per litre, while it was increased by Rs 2 or more per litre on three different occasions in the case of petrol. It is not just the central government that increased the excise duty, even state governments have increased VAT/Sales tax on petrol & diesel in the last 3 years. The VAT on diesel was more than 20% in only 10 states in April 2014, where as in August 2017, the VAT on diesel is more than 20% in 15 different states. The VAT on diesel was highest of only 25% in Chhattisgarh in April 2014, where as in August 2017, the highest was 31.06% in Andhra Pradesh. The VAT on petrol was at least 25% in 17 different states in April 2014. In August 2017, it is at least 25% in 26 different states. The VAT on petrol was highest of 33.06% in Punjab in April 2014 where as in August 2017, the highest was 48.98% in Mumbai. Central government’s revenue through excise duty on petrol & diesel has more than tripled from 2013-14 to 2016-17. From Rs 77982 crore in 2013-14, the excise duty collection on petrol & diesel more than tripled to Rs 242691 crore in 2016-17. The VAT/sales tax collection on petrol & diesel increased only marginally in the states. From Rs 129045 crore in 2013-14, it increased to Rs 166378 crore in 2016-17. Though VAT on both petrol & diesel has increased in percentage terms in many states in the last 3 plus years, the VAT revenue in states has not increased proportionally. This is because the base price of petrol & diesel has substantially decreased in the last 3 years on account of reduction in global crude oil prices. Of all the states, Maharashtra earns the maximum revenue through VAT on petrol & diesel. Maharashtra has consistently earned more than Rs 19000 crore since 2013-14. In 2016-17, the total revenue collection in Maharashtra reached Rs 23160 crore. Only four states (Maharashtra, Gujarat, Uttar Pradesh & Tamil Nadu) have earned more than Rs 10000 crore through VAT on petrol & diesel in each of the years since 2013-14. In 2016-17, six (6) states earned more than Rs 10000 crore each on revenue through VAT. The total contribution of petroleum products to the central & state exchequer has crossed Rs 5 lakh crore in 2016-17. Out of the 5 lakh crore in 2016-17, central excise duty and state VAT account for more than 4 lakh crore. Will Regulating acid sales reduce Acid Attacks?